I’m cross-posting this event recap from Boston Skeptics, since this has been such a great week for Skepchick get-togethers! 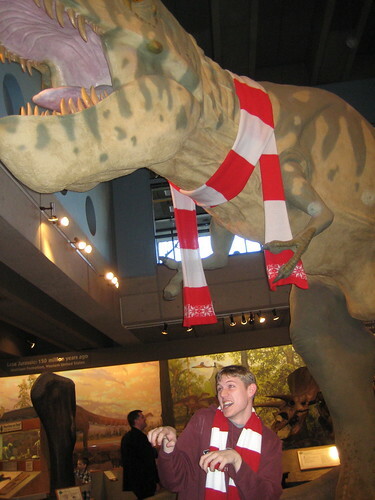 Yesterday’s field trip to the Museum of Science was a big success! We had about 40 people show, which I thought would be a logistical nightmare but which turned out to be completely awesome. The Mythical Creatures exhibit was well done with appropriately skeptical and sciencey explanations, and lots of unicorns. 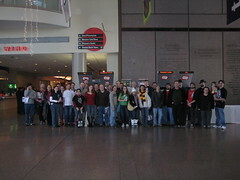 The Science of Fear exhibit was, okay, not particularly scary to most of the group but still fun. We saw two really entertaining shows: one was the indoor lightning demo with the Van Der Graff generator, which included the presenter telling everyone to not just take his word for it, but to explore and experiment and understand for ourselves (but maybe not with a Van Der Graff generator). We also saw a great optical illusions show with a presenter who we all immediately tried to convince to come to Skeptics in the Pub (he might!). A sample of his talk: “You think you can taste chocolate? YOU DON’T TASTE CHOCOLATE, YOU SMELL IT!” He was wonderful. We also saw one really, really lame show, but that didn’t really count because technically it was just a tree talking at us. After the museum, we hit Porters Bar & Grill for boozy fun. The one big disappointment was that our speaker, Barb Mervine, was literally trapped in New Hampshire with no power or phone thanks to an ill-timed ice storm. So, instead of hearing about UFOs, we were forced to talk to each other. Oh, the humanity! More photos and favorite moments after the jump. 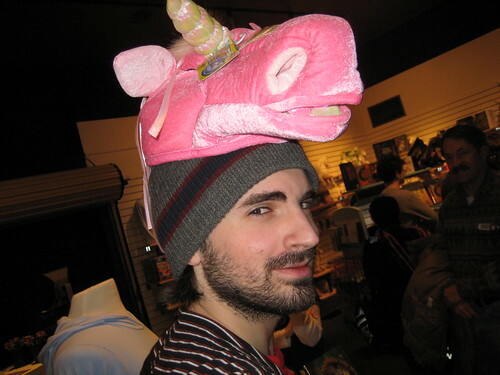 Photos weren’t allowed in the Mythical Creatures exhibit, so I took this photo of a Jaredcorn out in the gift shop. Before entering the exhibit, they took our photo in front of a green screen that happened to match my shirt perfectly. 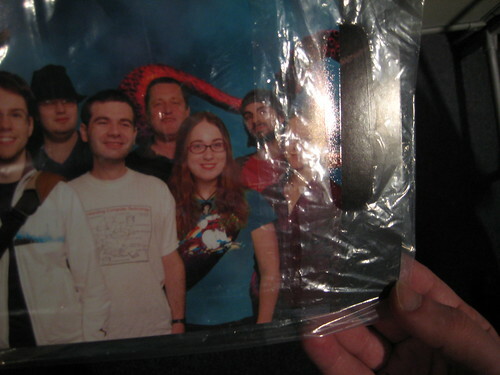 I found this more amusing than I should have, but not amusing enough to pay $20 for the photo. 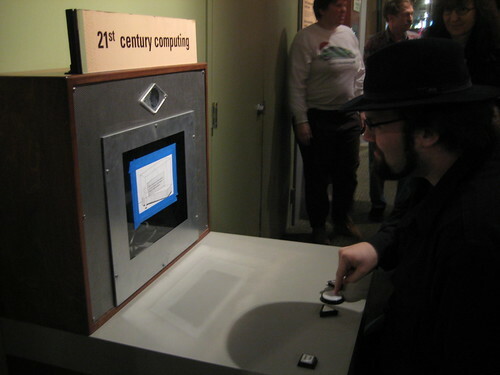 The 21st Century Computing exhibit was borked. As Blake Stacey proclaimed, “Look, a Windows Vista display!” Luckily, we had our own IT guy there to fix it. Perhaps my favorite was this Hobo Exhibit. 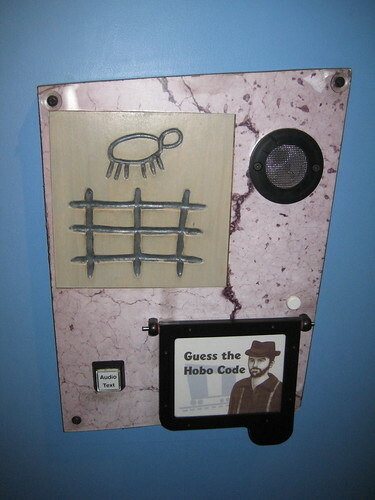 Can you guess the hobo code? Here’s the answer. Later on, we found ancient hobo codes as well. Why have I only just noticed that the hobo looks like Josh (above, IT guy)? John came appropriately dressed as his favorite exhibit. More pics are on Flickr! I just noticed that about the hobo, too. It’s Grampy Trampsalot, my long-lost hobo ancestor! ZOMG! Anyway, I put up my own Flickr photoset, which includes some shots of the lightning show and, more importantly, the HEARPHONE. I am so disappointed that I missed the outing. Stupid ice storm! Who would have thought that it would put the train from Portland out of commission. So when is the line of Skepchick hobo mascot products launching? Perhaps that can be the theme for the 2010 male calendar. The Skepchick store needs to start selling skeptic-themed bindles. I’m terribly amused that you both had that revelation about the hobo, considering that I thought the same thing as I looked through the Flickr feed! So amusing. I’m having a bit of non-buyer’s remorse about that dragon hat. I should totally have bought it…even though I don’t think it would have stayed on my head all day. Thanks again to everyone who came out, that was a blast! We’ll do it again soon-ish at the Aquarium, perhaps? D’oh, I meant unicorn hat. The dragon was the one Rebecca tried on. Oh well. Seriously, not only do we have similar facial hair and hats, but I also have a pair of pants with suspenders. Which I guess now I have to start wearing more often, at least when I’m out hobo-ing. That’s it. We need to have a Hobos in the Pub meeting. Or, perhaps more fittingly, a Hobos Around a Trashcan Fire Outside of the Pub meeting. Wait, I’m totally thrown off by the word “green”. It looked a lot more like blue to me. @Freiddie: Look at the first picture Rebecca posted. Rebecca is in the middle wearing a green shirt. In the 3rd picture her shirt is blue. We need a skeptics code like the hobos use. Somebody can draw a symbol on the outside of Tommy Doyle’s to indicate what kind of guest speaker we’re getting that night. If the dude from the optical illusion show is presenting, we’ll draw a spiral. Crosses, flying saucers, bigfoot… what could we use for Sylvia Browne? That’s weird… how did it turn blue in the next picture? @Freiddie: the museum was using a “green screen” to project a picture of a Krakken undersea behind people having their photo taken. Because my shirt was the same color as the screen, my shirt picked up the projected image, turning it blue. Since, on Saturday, there were already two guys ( I never caught the Josh dress-alike’s name ) dressed as hobos or Joshes ( or were they Krakkens … I get so easily confused ), maybe for the next event all men should come dressed as hobojoshes ; that could be code for … I dunno … but for a second I thought the Blues Brothers were amongst us … but if we were all dressed as hobojoshbluesbrotherkrakkens I’d know we all coudn’t be the Blue Brothers since there were only two of them and many more of us … and I’d be less confused. Clear? p.s. Great shots of the “lightning” Josh. Very nice pics! @Rebecca: Uh! Silly me. I get it now… that filming technique with the solid-colored screen etc. I guess I never heard of a “green screen”; I’m more used to “blue screens”. Hobo code? Is that like a secret language? halin: Thanks! I was really pleased with how those shots turned out. For the record, I had set my camera to do long exposure shots — I think 1/2 second intervals — in order to record enough light and also so I didn’t miss the sparks. I’m surprised the shots weren’t blurrier, considering that I didn’t have a tripod or anything. Also, I suspect the “look-alike”, i.e. the other guy in the coat and hat, was our own Blake Stacey. I feel so sad I didn’t make it! Power lines blocking the main roads and ice everywhere… in fact I just got back power this evening. I have been camped out for days on a futon that smells highly of dog. Still…the wonderful UFO quiz (with prizes) is still waiting, and I would LOVE to be invited to speak again sometime. Really, how else will you know about the Venusians? So make it fedoras and black coats with pants being optional.